Women along with their new-born children wait to see doctors at a local hospital in north-east Côte d'Ivoire. The infants are to be vaccinated against a number of diseases, including Yellow Fever. In addition, families will be provided with mosquito nets, which are an important protection against mosquito-borne diseases. 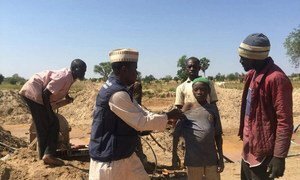 Amid a resurgence of yellow fever outbreaks, the United Nations together with partners, has begun an ambitious campaign to vaccinate close to one billion people against the deadly disease across 27 high-risk African countries. “With one injection we can protect a person for life against this dangerous pathogen,” said Tedros Adhanom Ghebreyesus, the Director-General of the UN World Health Organization (WHO), launching the Eliminate Yellow Fever Epidemics (EYE) in Africa strategy in Nigeria’s capital Abuja alongside the country’s Health Minister, Isaac Folorunso Adewole. The goal is to rid the continent of yellow fever – a viral disease with potentially fatal consequences – by 2026. “This unprecedented commitment by countries will ensure that by 2026 Africa is free of yellow fever epidemics,” added Mr. Tedros. The three pronged strategy focuses on protecting at-risk populations through preventive mass vaccination campaigns and routine immunization programmes; preventing international spread; and containing outbreaks rapidly. “Almost half of the people to be vaccinated are children under 15 years of age [and] this campaign is critical to saving [their] lives,” said Stefan Peterson, the Chief of Health at UN Children’s Fund (UNICEF). As an EYE strategy partner, UNICEF will make vaccines available, advocate for greater political commitment, and provide support in vaccinating children through routine immunization as well as during outbreaks of the disease. When yellow fever re-emerged as a public health issue in the early 2000s, countries in the region controlled the epidemics through preventive mass campaigns combined with routine immunization. “No yellow fever epidemics have been recorded since in countries which successfully implemented this approach,” the UN health agency added. Ensuring sufficient supply of vaccine and sustaining the levels in the mammoth undertaking is critical to the overall campaign’s success. This is where Gavi, the Vaccine Alliance, comes in. Composed of UN agencies and the World Bank, as well as public and private health entities, Gavi has been working to improve global vaccine supply and to ensure there is enough to respond to outbreaks, allow preventive campaigns and that routine immunization functions at full capacity. “This comprehensive, global strategy offers an unprecedented opportunity to end the devastating yellow fever epidemics that periodically impact Africa,” said Dr. Seth Berkley, CEO of Gavi.